The metro in Amsterdam is a light rail network which is useful for travel down the central spine of the city and can get you to the outer suburbs of Amsterdam. The metro in Amsterdam is run by the municipal transport company GVB and is part of the R-NET network in North Holland. There are 5 lines (M50/M51/M52/M53/M54) with a total network length of 52km which includes 60 stations or stops. In July 2018 the M52 North-South line opened which links the Amsterdam North suburb to Amsterdam South via the city centre. The metro network is fast and efficient and passes through all the main business and office districts of the city including many Amsterdam rail stations. The metro is the quickest way to get from say Central Station to Waterlooplein or De Pijp. The Amsterdam Metro first opened back in 1977. 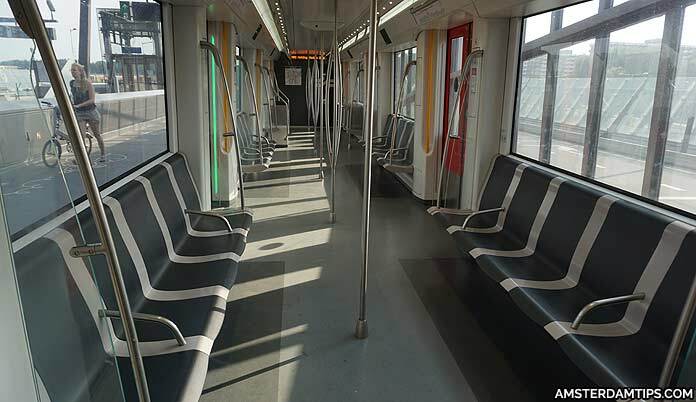 There are 4 different types of train stock being used, the newest of which are the silver and red Alstom “Metropolis” M5 metro trains which can carry nearly 1,000 passengers. Below is our exclusive map of the Amsterdam Metro network which also highlights NS train lines. Note that Amsterdam Schiphol airport is accessible by train and not the metro. In the coming years line 52 may well be extended to the airport. 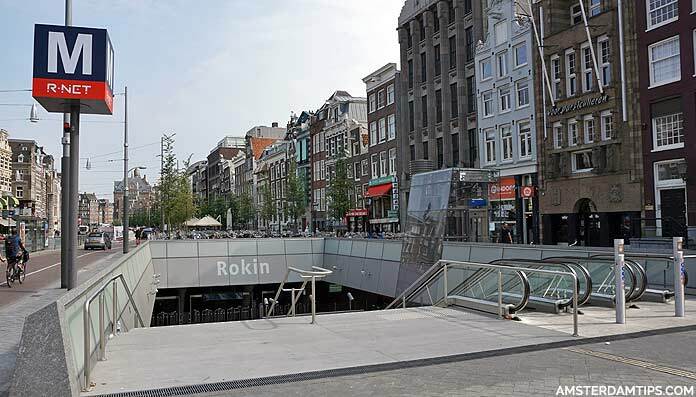 The new North-South line (Noord-Zuidlijn) can be useful to city visitors with stops at Central Station, Rokin, Vijzelgracht, De Pijp and Europaplein (RAI). It has reduced journey times, particularly on routes where trams were in use beforehand. The 9.7km line was under construction between 2003 and 2018 and cost €3.1 billion. All of the M52 stations feature some form of artwork. For example the Flyways birds on the platform at Noord, the 7 Gates brickwork scupture at Noorderpark, the tiled walls and historic artefacts on display at Rokin and the light installation Ramses Shaffy, Lifelines at Vijzelgracht. 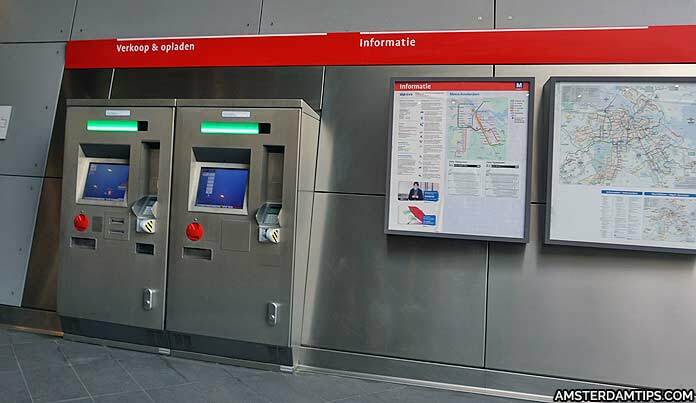 The OV-chipkaart (OV-chip card) is the public transport smart card system for the Netherlands and is in use on the Amsterdam Metro. Passengers are required to check-in and check-out of their journeys using the card readers either at the gate barriers or on platforms at smaller stops. There are a number of different public transport ticket options available for Amsterdam. Disposable tickets include the GVB 1 hour fare (€3.20), the Bus Tram Metro (BTM) 1.5 hour ticket (€6.50), the GVB 1-7 day tickets (€8 to €36.50) and children’s day ticket (€4) – 2019 prices. These can be bought from the GVB ticket machines at all metro stations or GVB Service & Tickets desks at either Amsterdam Central, Amsterdam Bijlmer-ArenA, Amsterdam Sloterdijk, Amsterdam Zuid and Station Noord. Alternatively you can also purchase the GVB day tickets online here (valid on the Amsterdam metro, trams and GVB buses) and pick them up at a GVB ticket office. You can also buy an empty anonymous OV-chip card for €7.50 which lasts 4-5 years. On top of this you need to load some credit onto the e-purse – this can then be used for travel. You need a minimum of €4 to check-in for a journey on the metro with an anonymous OV-chip card. The fare is calculated as a €0.96 flat boarding fee plus €0.162 per km travelled. The correct fare is automatically deducted from your card on checking out. Is There a Left Luggage Facility at Amsterdam Central Station?